As often happens a client is the catalyst for new discoveries. This time a client requested olive wood utensils. Having seen many I assumed it would be a quick easy request. As usual, it became something much more. While there are obviously thousands upon thousands of olive trees in Italy, there are not so many available to make olive wood good from. And, while there are commercially made spoons, cutting boards and rolling pins, there are not so many crafted bowls, boards and utensils (that are actually made in Italy). With the internet it seems easy to find online anything you want. However, like many products, there is often a large difference between the lovely photos and catalogs you find and the quality of the finished pieces. And, the location of manufacturing can be far from where olive trees are grown. Olives have been cultivated throughout the Mediterranean throughout history. The Romans cultivated olives throughout Italy and olive oil became so valuable they even used it as collected taxes. Ancient olive wood is beautiful and a real sustainable source. As I have mentioned in earlier posts, olives produce for hundreds of years, but eventually they stop producing and are classed as ancient. Usually it is this wood that is gathered and used for crafting the larger pieces of olive wood you see. The large cutting or carving boards, the table tops or large salad bowls. Every tree has its own unique pattern in the grain. You will never see two pieces created of olive wood that look exactly the same. Olive wood is very hard, strong, durable and has natural anti-bacterial properties which make it ideal for production of items used for food. If cared for properly, olive wood items will last hundreds of years. So an ancient piece of wood becomes an antique long after it is harvested. Olive wood bowls, and utensils of the highest craftsmanship are not as ubiquitous as you might think given how many trees there are here. Because the olives are a most important crop healthy trees are never felled for use of the wood. The limited availability is part of the reason for the high cost of quality olive wood articles. Although there are artisans in almost every region with high olive oil production, there are not as many craftsmen who work with olive wood. In Tuscany, I understand there are only a handful of artisans who work with olive wood. And, they tend to specialize in the types of pieces they like to make. 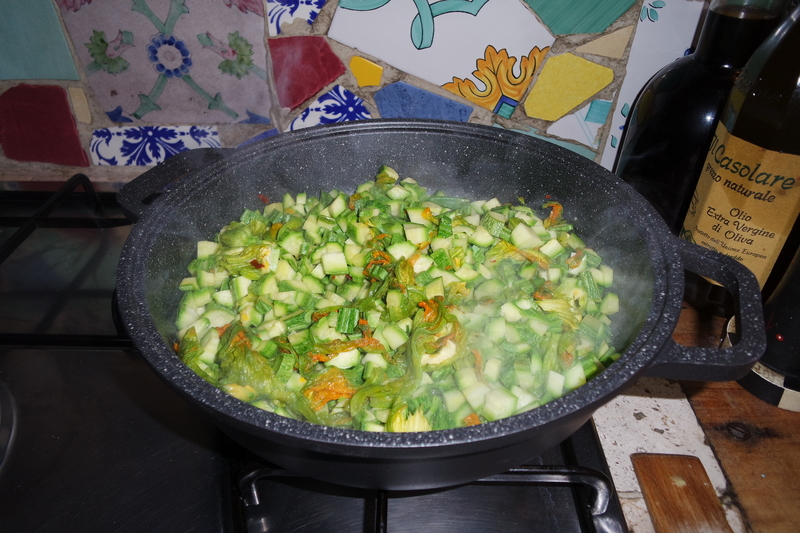 There is one craftsman in a small town near Sienna that makes only small to large pots with lids, another near Florence that works only bowls. It seems that each artisan has their specialty. That is why I tried to find someone who has worked with these artists and could inform me how to determine the best pieces. Luckily I found Ricardo Amoruso. He is from Tuscany and has resources throughout the region for artisans in a number of categories (his wife is a ceramicist) including the few who specialize in olive wood. Ricardo explained to me that there is always a shortage of olive wood. If the spring weather is below normal for too many days I believe he said 15) in a row the tree can be damaged and not just lose the crop of olives, the tree can be damaged beyond survival, but the wood also can be unusable from the stress of the cold. He explained that there are numerous makers of kitchen utensils because those do not require the whole tree to be used. In spring when they must prune the branches, they are collected and many are thick enough to be able to form spoons, spatulas and rolling pins. They are the most affordable of pieces in olive wood. Once I saw some of the fine works he handles I knew that this quality was superiorto most of the other pieces I have seen. The prices will always be high so it is important to get the best quality wood that is formed by the best artisans. His advice on how to make your wood pieces last forever… Do not soak them, or put in a dishwasher. Use only water to clean them. About once every month or so, brush or wipe on a light oil like coconut or sunflower oil and let it sit on some newsapers several hours or overnight. Afterward wipe any left oil with a paper towel.It is important to keep the wood from over drying. This prevents cracking or warping. There are some really spectacular pieces that I am now sure I must have. The bowl below is from the works I purchased for another client. This totally unique flat salad bowl is so stunning I start to drool every time I look at it. Every trip to Italy introduces me to new places, people and products. It seems a never-ending journey. I have introduced my Sardinia honey source to olio nuovo from Farfa, I have been able to learn about the different grades of cashmere from my scarf vendor in Florence (who uses only Italian materials and workers and produces all she sells right outside of Florence). There are so many fine olive oils available from every region but my clients are spoiled by the consistently fabulous taste of Il Saporito’s olive oil from Farfa. It is always a challenge to get everything done in the short time I have in Italy (a month is hardly enough time to get your breathing slowed down). And, I always end the trip with my stop at Campo dei Fiori to fill up on the “Spezie Famose nel Mondo” and meet up with Mauro Berardi for his amazing spice mixes that have people all over the world addicted. If you are not already on my mailing list, just send your email to: expresslyitalian@aol.com and I will add you to my product availability lists. There is never enough time here, never enough space to bring all I would like and always too much weight. But I love it and hope to continue to introduce products and people from Italy to as many as I can. 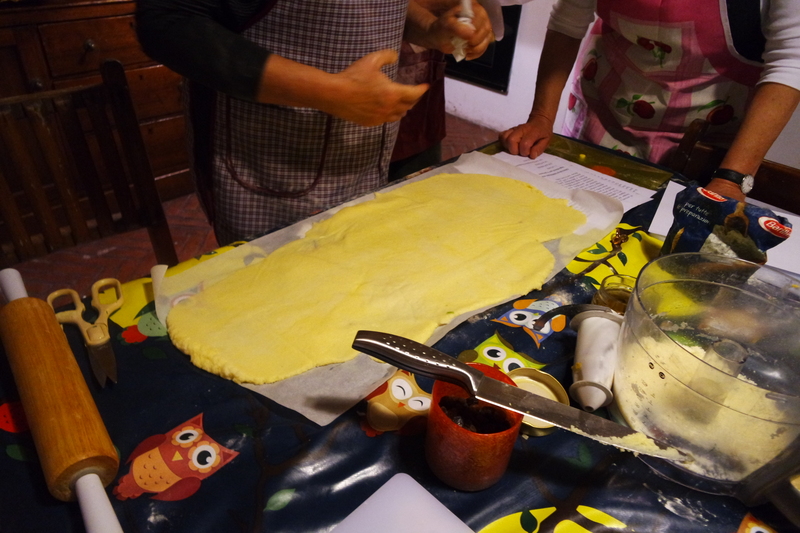 This entry was posted in Artisans, Campo dei Fiori, Italian food, Italy, Italy travel, Mauro Berardi, Rome, Sabina, Shopping, Spices, travel, Tuscany, Uncategorized and tagged Campo dei Fiori, Chocolate, Food, honey, Italian crafts, Italian food, Italy, olive oil, Olive wood, Rome, sea, spello, summer, travel, Tuscany, Umbria, Wood working. Rome is my favorite city in the world. I love being here. Although sometimes the graffiti and dirt dismay me, and admittedly my stomach often reaches my throat when I see how close cars come to one another or worse to the buses, While I am far too old to consider driving a motorino in this city, or maybe I never had that kind of courage, I do admire all those lovely women on their way to work looking worldly and chic. And I wish I had found myself in Rome much sooner. I remind myself often that I am not a tourist on vacation. My schedules are full but have nothing to do with tour groups or monuments. My friendships in Rome run very deep and anchor me solidly to this country. 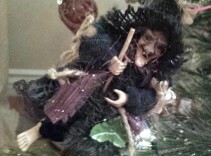 I am welcomed into the home of a dear friend no matter the duration of my stay or how frequently I “visit”. I have parts of myself stuck in Florence, Milan and a few other cities as well. But, Rome . . . . Being here is more about reconnecting to the people and places so dear to my heart than just visiting. I am in Rome, but not of Rome. Too many people have passed over her streets and vicoli for me to ever really be a part of all this history. 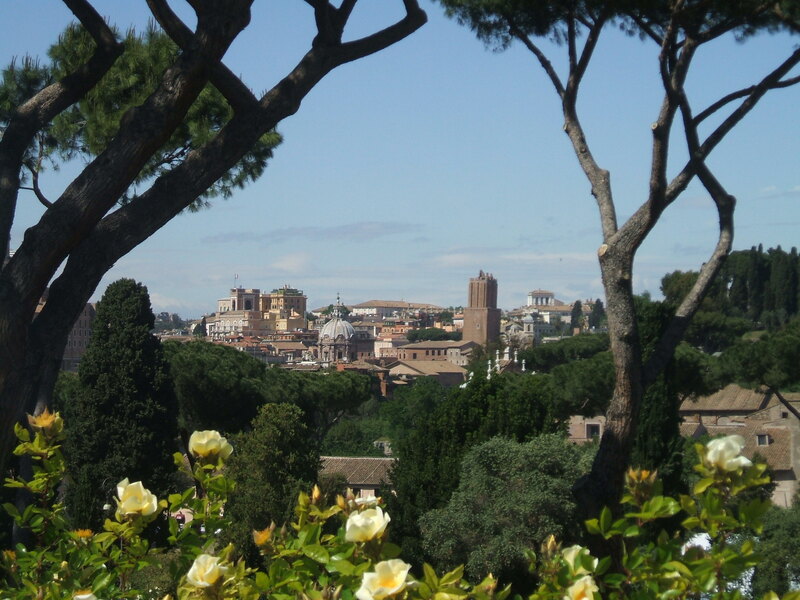 Sometimes I regret not having found myself in Rome earlier in life, but I do not really believe it would be different. I have not given up on speaking Italian well, but I have been re-thinking my aspirations of fluency. Yet each conversational attempt is met with affection and patient correction. from strangers as well as my friends. My days are crushed with the same things anyone returning home has; setting up meetings, making phone calls to friends planning lunches and dinners, and for me shopping. 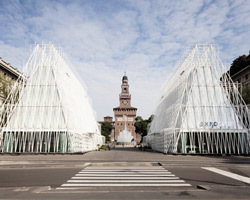 And, getting here is the beginning I need arrangements for travel to shop in Milan, Florence, and on this trip Bari. Expressly Italian was born to help cover the costs of my travel. No plans for expansions, or growth, only my desire to continue striving to afford my need to be in Italy. It is exciting since every trip brings new people into my life, new products to share with Americans. Today, I was introduced to a lovely woman living south of Rome. 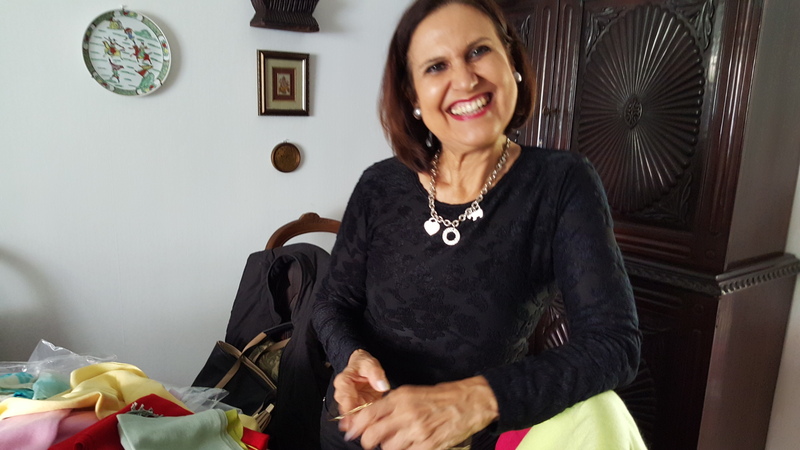 She has lived in Italy fifty years, although she was born in India. She is intelligent, well spoken and thoughtful. And her name is Ushabella. Is that not a lovely name? She had worked many years for an airline when she was laid off. Then she began to think of ways to utilize her talents and connections. She is currently representing a cable and wiring company from Delhi. She also has pashmina from India nicer than I have seen in years to sell. They are luscious colors and really fine quality. Unfortunately for both of us, Expressly Italian specializes in only Italian products produced by Italians. But I will certainly see if I find anyone to connect her with. There is synergy wherever you look and more understanding of how much different and the same we all are if you are interested. I am grateful that Expressly Italian is offering me the challenge of getting real Italian tastes into mouths outside of Italy. Each trip I seem to find new beauty unseen by me before. I know that will never end. 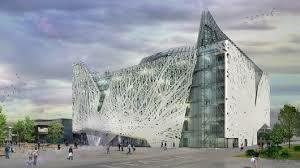 At heart, Italy is really all about beauty; in words, art, mountains or sea coasts. I hope if you have been here or not visited recently that you will see for yourself how life changing Italy can be for you. In the meantime you can allow Expressly Italian to introduce you to the many items never sent outside Italy. You can try some of the special olive oils produced in small batches, some of the famous Mauro Berardi spic3 mixes from Campo dei Fiori or some of Sardinia’s purest, healthiest honeys Stefano cultivates and soooo much more. Email or comment but do send your questions or requests. 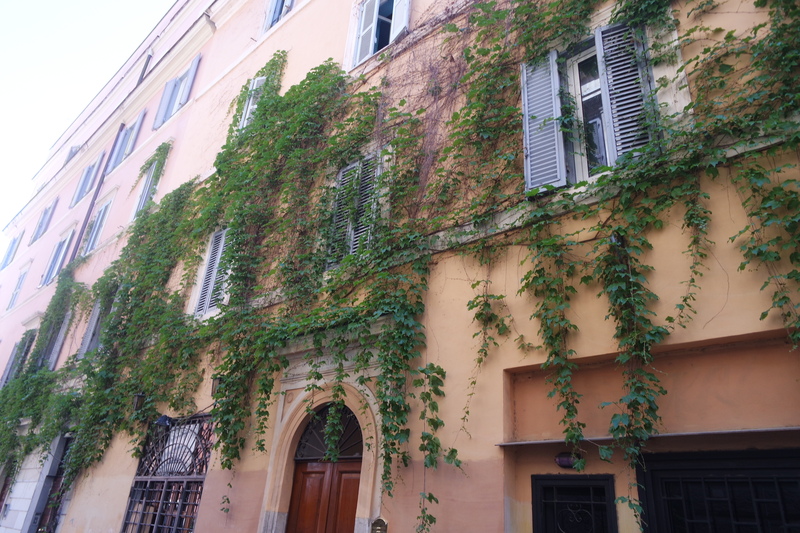 This entry was posted in Uncategorized and tagged apartment rentals, Campo dei Fiori, Carnival, cooking Italian, Food, honey, italian beaches, Italian food, Italian travel, Mauro Berardi, Milan, olive oil, Rome, spices. SUMMER 2014 MAY BE ENDING BUT HERE COMES EXCITING FALL! Well, as August ends, Italians are returning to work from their vacations (vacanze). Most Italians do not travel outside the borders of their country. It may seem that has been happening more often with the poor economy, but honestly, it’s always been that way for most Italians. They love their country. Within it’s borders are almost any type of environment you could want for vacations; mountains, lakes, two seas to explore the beaches of, as well as more art, monuments and historical locations than almost anywhere else in the world. Why would they leave? 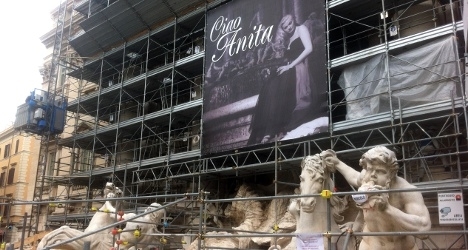 I recall my husband talking to a co-worker shortly after our arrival in Rome. He told the guy we were going to Venice and he was very excited. The older man shrugged his shoulders (it takes a couple of years to develop the Roman shrug) and said have a good time. Mike asked if there was anyplace special that we should make an effort to see. The man responded “how would I know, I’ve never been there”. When Mike asked why in 70 years he’d never visited there. His response was “Why?” Everything I want is here in Rome. And, there are quite a few Italians who never venture beyond their province or commune. For us American’s it is hard to fathom that thinking. We love to go whether it’s in the US or abroad. We’re adventurers. Which brings me to something I’ve been waiting to share with you. Some of the names have been changed to protect this man’s identity. I admit when I first received this accounting I was rolling on the floor laughing. 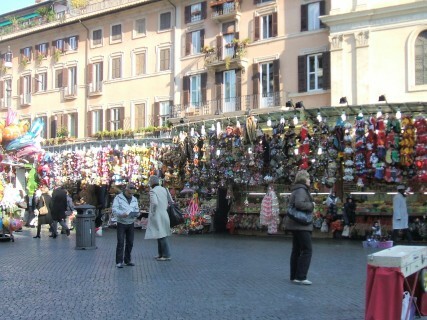 Not only is this entirely possible wherever you travel, but can be expected in some variation on any trip to Italy. This man, a Californian, decided to take his adult daughters on a trip to Rome. He’d only been there many, many years ago for a short trip and one of them had never been there. The last I saw of him was on the via Veneto where outside his lovely hotel I was giving directions to the next stop on his trip – Tuscany. He’d rented a car, it had GPS, he was confident. His travel agent had worked out the full itinerary with directions. And, he said he followed the directions exactly. When they arrived it was getting dark, but it appeared the location was not at all as promised. It had all the amenities as promised, BUT. The pool was covered, filled with leaves and had grown green water. The chairs around the pool and tables were plastic and overturned on the lawns. All of them. He was a little concerned that it had an entirely empty parking lot that would hold 60 cars. They found the restaurant was closed and there was not much activity anywhere nearby. His daughters were the ones who realized they were in a hotel with the same name as their reservations, but hours driving time away from where they were that evening. . This after lugging overweight luggage up several flights of stairs (no elevators). Nothing could be done until the next day anyway, but it was not a happy evening. The next mornng they drove to the correct hotel, which was gorgeous. By then, things were a little tense between them since they had lost a whole day of our precious vacation. He said they did spend lots of time investigating Montepulciano, which has become one of his favorite places. A salvaged vacation after all the previous difficulties (yes they also had arrival problems in Rome, tour guide problems there, and more). Then came the last day of the trip. One of his daughters became quite ill and had to go to the hospital in Florence. The other daughter returned to her home in New York on her scheduled flight. It turned out the hospital was quite helpful and kind. She was only really dehydrated and needed an IV for hours but was fine afterwards. Of course, they missed their flight back to California though. They were booked on Alitalia, on their last day of their direct service to LA. There were no more direct flight from Rome to LA. (For the record I remain confounded that there is no direct flight from Los Angeles to Rome from late October until March !) They had to leave the hotel in Florence with three overweight bags between the two of them. They still have no idea how they managed it, but they got the train, along with their luggage from Florence to Rome (near the airport for easier access). There were no available flights and he felt Alitalia was unhelpful. It does seem like they could have arranged something with their partner airlines (Delta, Air France, or KLM). They got rooms at the Best Western near the airport (where few other than travelers speak English) and it’s truly in a barren industrial area. He called on his cell phone every airline he could find (his cell bill was $1,800). His local Vodafone SIM had been used up and where he was there was no Vodafone place and he could not understand the texts he kept receiving from them instructing him what to do. Alitalia told him he would have to change his reservations through his travel agent because that’s how he made them. (Of course, by this time he’d fired the agent.) The agent was not returning his phone calls. Finally, he truly panicked and just wanted to get home. There was literally no way to get out for days, unless they would take Air Nigeria to Turkey, then three stops in Germany, an overnight at Amsterdam, then New York and then LA. Even panicked he knew he could not do that. So, like any good American, he “bought” his way out. He spent over $6,000 on airfare to take British Air to London and London to LA. And, of course, that was not for first class flights. But, he had waited several days already and enough is enough. He missed four days of work and the vacation costs were much higher after his vacation was to have ended that it was for the rest of the trip. Sometimes, it’s just that bad with traveling. Thank goodness it’s not often. And, much funnier when it happens to someone else. He said “Italy was beautiful but he was not ready to laugh about it yet”. Hopefully, enough time has gone by that when he reads this he’ll appreciate the experience a little more. Being prepared is good. Knowing things will go wrong is even more important. I’m readying for my fall trip – think olio nuovo, fresh olive oil. Honey, and new found products. If you want to receive the newsletter on available products, please email me at: expresslyitalian@aol.com. If you have any questions about how to use any products or suggestions about what I should try to find, let me know. 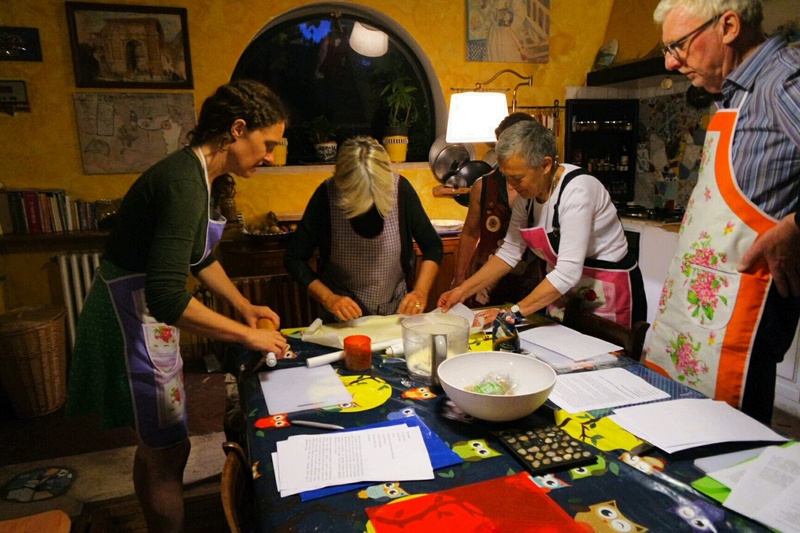 For sure I will be stopping at Campo dei Fiori for spices from Mauro Berardi and his”famous spices of the world” as well as Umbria and Tuscany for first pressing olive oils, the Maremma for Botarga and a few other specialties. And I’ll also visit Torino for a chocolate festival and stopping to pick up some of that fabulous Sardinian honey and who knows what else. I’m open to any suggestions. Just let me know if you have any special requests. I’ll be happy to do what I can to help. 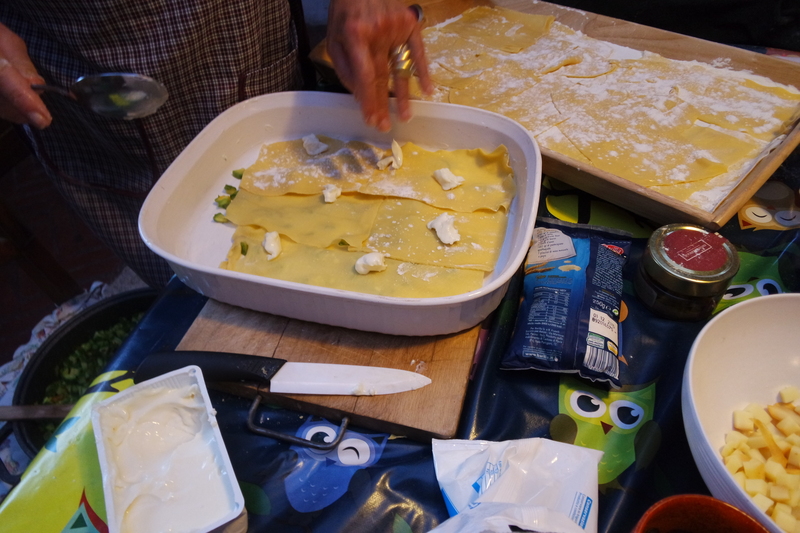 This entry was posted in Italian food, Italy, Living in Italy and tagged Campo dei Fiori, foods, Italian food, Italian travel, Italy, summer, Tuscany. I love the Maremma. So many people visit Tuscany and think they’ve seen it all after Sienna, Florence, Orvieto and maybe a few hill towns. Nope. The western part of Tuscany by the sea is so special, it deserves much more attention than it receives. 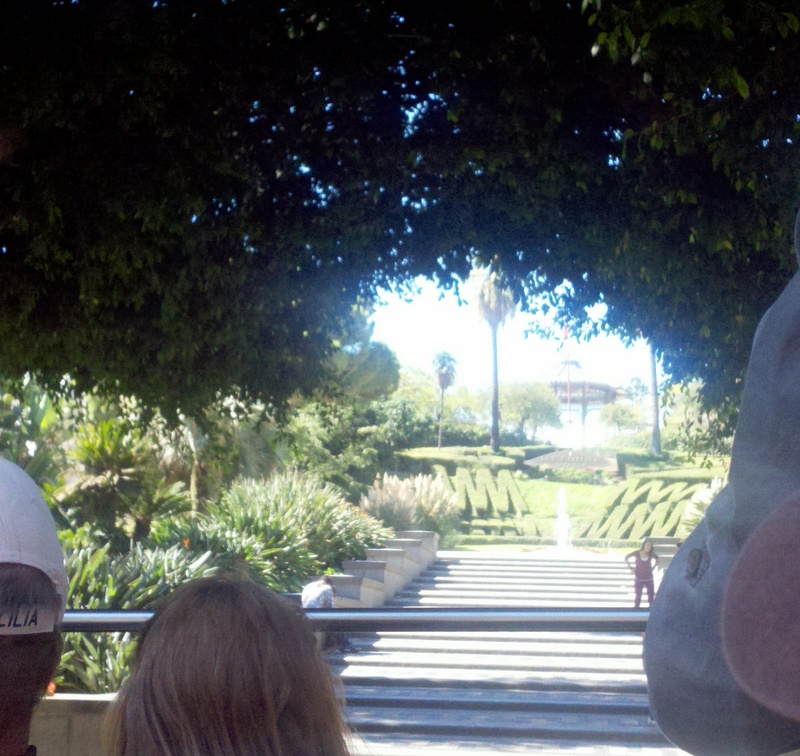 On the other hand, it’s nice not to be over run with tourists. While the whole of the Maremma covers a large area, I know the area near Grosseto and south best. The Maremma area has almost timeless roots. The Etuscans long before the Romans lived in this area. They built cities and developed agriculture in the midst of beautiful landscapes. Many of the people still living in this area are descendants of the Etuscans, a people who lived in this part of Italy long before the Romans. While much is unknown about their civilization, the Etruscan people were known to be intelligent, gentle people with many advances in their culture and few wars. They were easily made extinct by the Romans. There are many both Etruscan and Roman ruins in this area to be explored. Pitigliano, Manciano and Montiano are only a few of the spectacular hill towns. But it’s the sea and the towns of Porto Santo Stefano, Orbetello, Albinia and Capalbio that keep my heart in the Maremma. 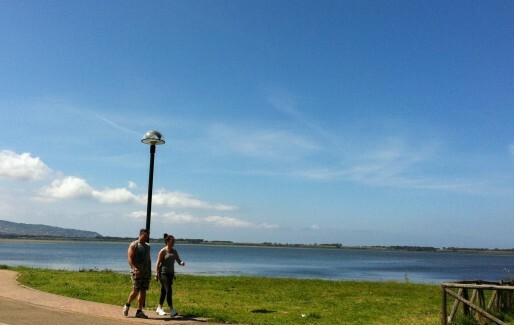 Orbetello is on a thin strip of land that crosses in the middle of a coastal lagoon. The isthmus joins the Argentario to the Tuscan mainland. 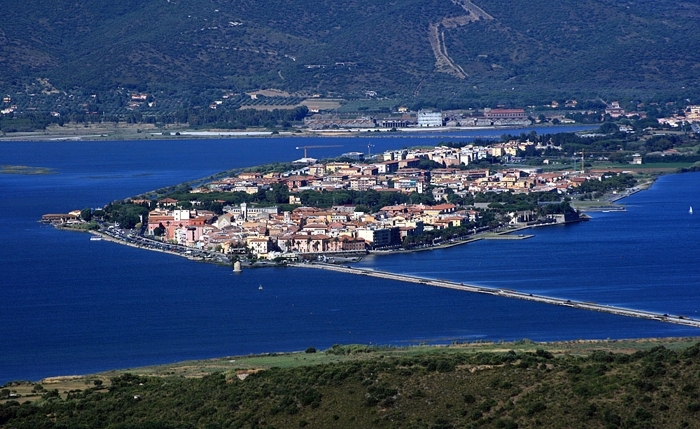 Although Orbetello is surrounded by lagoons it is also connected to the Mediterranean. There has been a settlement in Orbetello since the 8th century BC! Being on the sea means fishing has always been important to it’s livelihood and culture. Orbetello is one of the few areas in Italy still producing bottarga, which is flaked and served simply with olive oil on warm bread or grated over vegetables and salads. It is finely grated and served over spaghetti to make their most famous dish ‘spaghetti alla bottarga’. 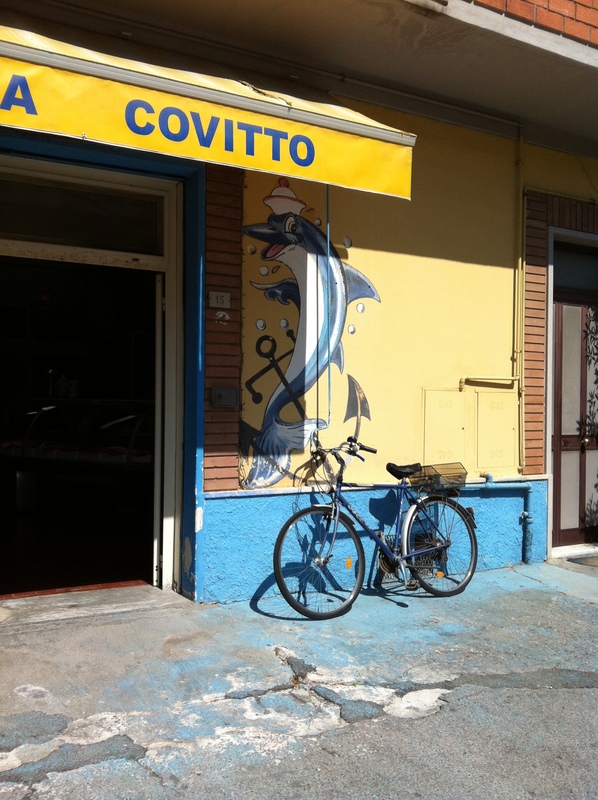 Covitto fish market has been in Orbetello since 1940. Domenico moved from the Amalfi Coast to Orbetello and brought his idea and process for making bottarga. His was the first Botarga made in this part of Italy. It is still made the same way. 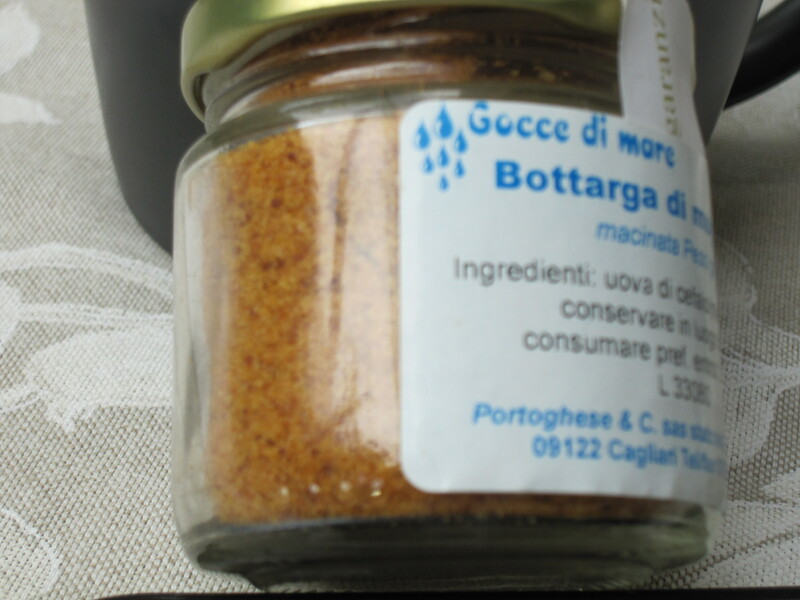 Bottarga di Muggine is famously used in Sicilian dishes. Buying the whole roe sack is quite expensive, but this grated bottarga is much easier to use and less expensive. It is wonderful over salads and vegetables, but the best known use is in Spaghetti alla Bottarga. You simply add a little olive oil to a pan, heat it and add a little red pepper flakes and add cooked pasta. Take it off the heat and sprinkle the Bottarga over the pasta and a good handful of fresh chopped parsley. So simple and yet so special. It takes only a little for very rich flavor. The 40 gram jar I have will last well past the end of this year if kept in the refrigerator. Bottarga is very rich in protein and Omega 3’s with a delicate and wonderful flavor. Domenico also brought with him from Cetara, the process to make Colatura di alici. Anchovy Sauce. It’s definitely part of the slow food movement. His famous amber condiment is delicate and available only in Italy. While they use it for pastas, it is a wonderful flavor for anything that needs a little depth of flavor. 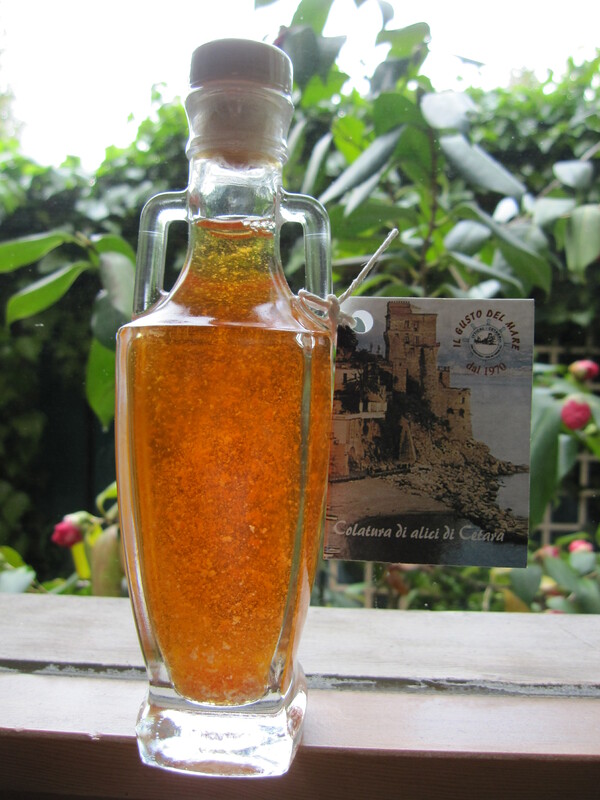 This amber magic is made by taking fresh caught anchovies with salt and laying them in a wooden container called a “terzigni”. After four or five months the liquid that comes out of the bottom hole in the container is harvested. It’s quite different than the Asian fish sauces. Delicate and uniquely flavored, it adds that indefinable extra to many dishes. For an easy Pasta dish, use a simple pasta and cook it as directed on the package. When it’s about done, heat about 4 Tablespoons extra virgin olive oil in a pan, add a clove of garlic, being sure not to brown it, along with some red pepper flakes to taste, and about 3 Tablesppons of COLATURA DI ALICI with a little pasta water. Add the drained pasta and sprinkle fresh chopped parsley over and serve. Keep the COLATURA DI ALICI handy to add additional over the top of your pasta to taste. This should generously serve 4 people. Colvitto’s fresh catch. This fish market has been ‘the’ place buy your fish in the area since WWII. 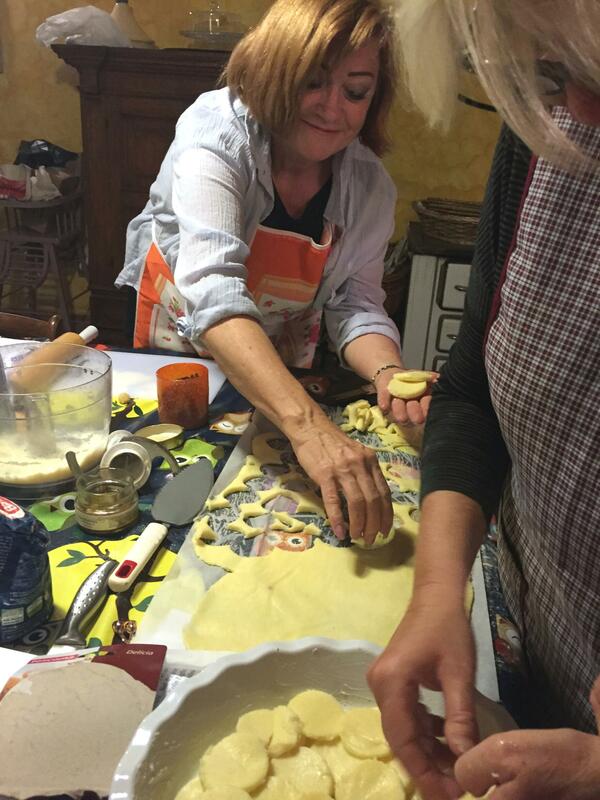 This area of Tuscany is full of regional typical products not generally seen outside the area. 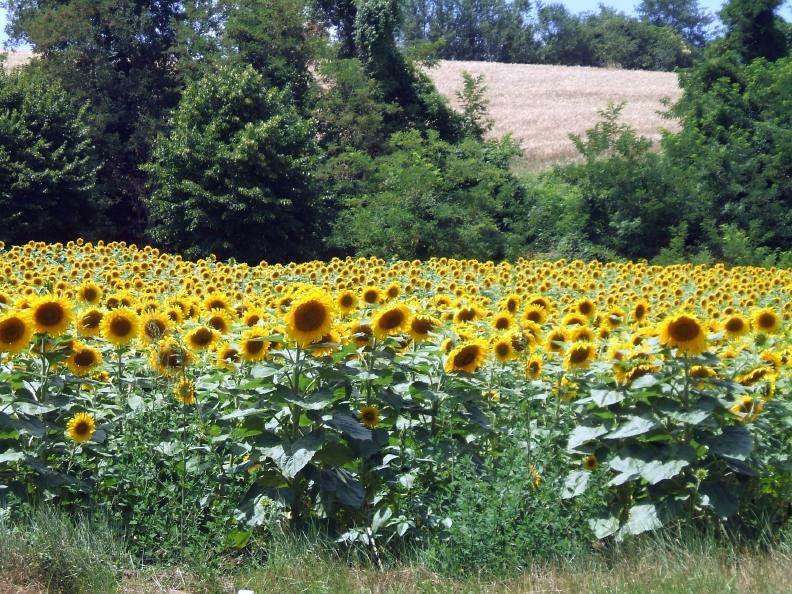 The Maremma is a mixture of farm lands, cattle ranches and seaside fishing villages. It’s well worth spending some time in this area and exploring the beaches as well as the ancient ruins all around you. From Albinia I brought back Conserve to be used with cheese or bruschetta. One I love is called Conserva del Buttero. 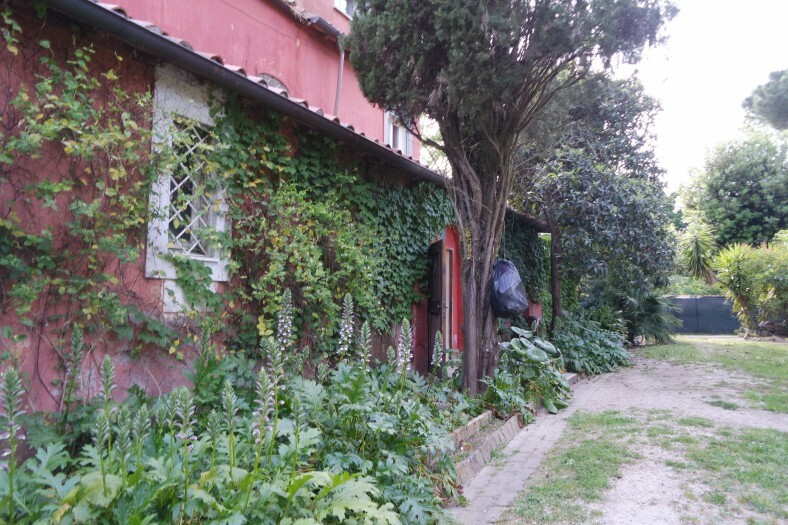 The Tuscan cowboys, horses and the Maremma sheepdog are all parts of this interesting area. The Conserva del Buttero’s ingredients include: peppers, peaches, apples, pepperoncino, apple vinegar, lemon juice and sugar. Wow is it great. It would be fabulous with meat as well as served with pears or apples. So many uses for these conserve. I hope you’ll try some of these magnificent specialties. Please feel free to email me at ExpresslyItalian@aol.com if you have any questions or want any additional information. I do hope you have the chance to explore this part of Italy. 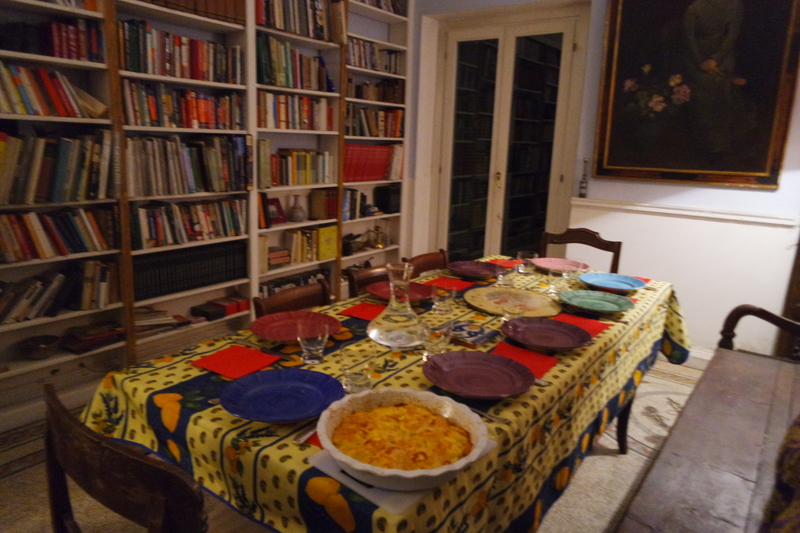 I ended my week with a fabulous dinner made by a long time resident of Montiano who fixed a fantastic cinghiale, with juniper berries and raspberry agrodolce sauce. Thanks Penelope, it was better than any I’ve ever had. 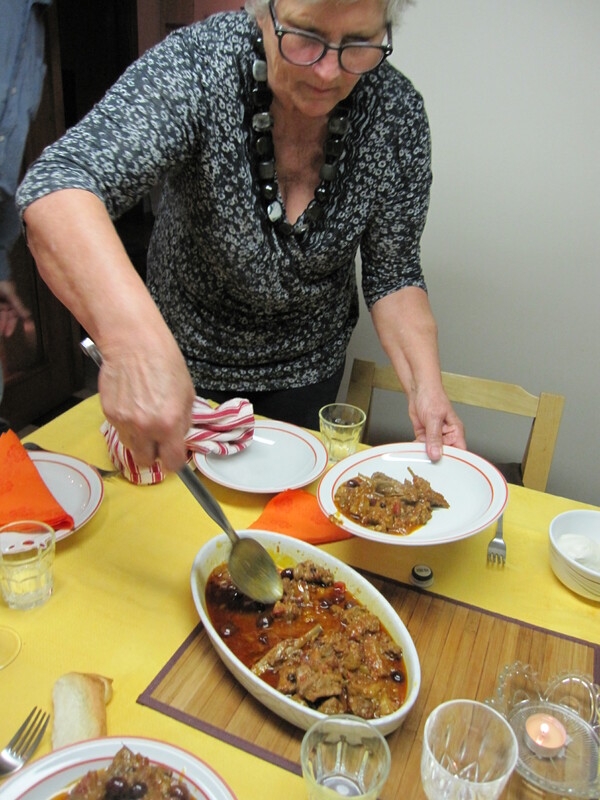 Penelope cooked a very special cinghiale – her own recipe. I have so much more to tell you about this special area, I’ll have to make another blog entry sometime in the near future to tell you about Albinia, the fantastic Alimentari un Mare di Sapori and explain some of the other local products. This entry was posted in Italian food, Italy, travel, Tuscany, Uncategorized and tagged Food, Italian food, Italy, maremma, sea, travel, Tuscany.